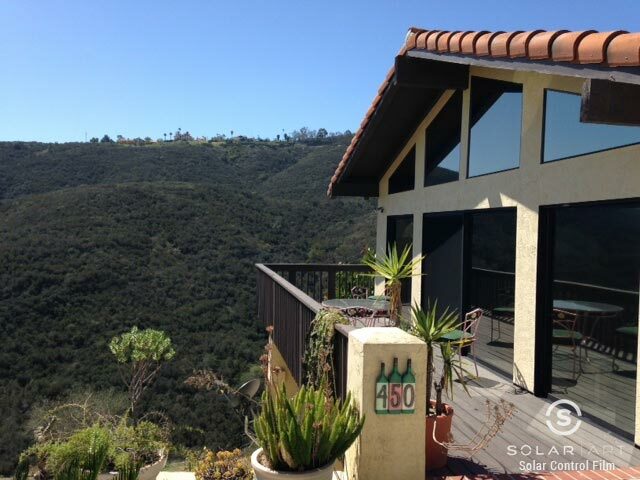 Solar Art installed Llumar reflective window film to a residence in Temecula, California! This customer’s primary problem was having no privacy from nosy neighbors and hikers. Their house was also getting extremely hot from the heat coming in through the glass. As you can see from the photo, they have beautiful views that can be seen from windows throughout their entire house. The homeowners didn’t want to give up those views they worked so hard for, but they also wanted their privacy. They tried having blinds and shades installed but were unhappy with losing their views and how dark their rooms were. They reached out to Solar Art to see what their window film options were. They worked with our sales representative and decided that reflective window tint was the best window tint for them. Reflective window film looks like a one way window film or mirrored film and prevents outsiders from being able to see in, while still allowing people to see out. Reflective window film is a heat blocking window film that can block up to 75% of heat that enters the space. This particular film also reduces glare and blocks 99% of UVA and UVB rays. Reflective window film will prevent this customers neighbors and hikers from being able to see into their home, while still allowing the homeowners to utilize their gorgeous views. Solar Art also frequently installed reflective window tint to commercial settings. They work great in both private offices and storefronts to increase privacy and reduce heat. Reflective window film is a type of solar film that is installed the same way as anti graffiti film, security window film and decorative window film and can easily be removed! Interested in Reflective Window Film? Contact us directly to talk about reflective window film! Reflective window film is a heat blocking window film that reduces heat, glare and blocks 99% of UVA and UVB rays. It also increases privacy! Contact Solar Art to learn more!